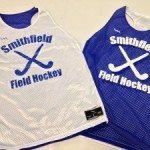 Womens Field Hockey Pinnies from Lightning Wear. The Girls South Park field hockey team wanted something to make them stand out on the field. They chose a pink racerback field hockey pinnie with a side logo accent and custom names and numbers. The team worked with one of our artists on the team name and number font. With dye sublimation the possibilities are truly endless. You can add names, numbers and logos in hundreds of colors without worry about budget or price. For around $34 a piece all in, you can get your logos, names, numbers, images or whatever you want printed. This is by far the most incredible process for apparel. The durability and wear for a custom sublimated racerback jersey is double that of a screen printed garment. More importantly, they look so much cooler.